The U.S. dollar continued its slide on Wednesday as political pressure on President Donald Trump increased, while the Turkish lira held steady against the dollar after top U.S. national security adviser John Bolton said the crisis with Turkey could end "instantly" with the release of a U.S. pastor held on terrorism charges. The euro hit a two-week high as investors rushed to cover short positions. Trump suffered a one-two punch on Tuesday with two former advisers facing possible prison sentences – and one of them saying Trump told him to commit a crime – possibly hurting his Republican Party's November midterm election prospects and widening a criminal investigation that has overshadowed his presidency. This dampened investor appetite for riskier investments across asset classes. The dollar index, which fell sharply this week after Trump criticized the U.S. Federal Reserve's interest rate increases, inched 5 basis points lower to 95.16. "Political pressure on Trump is increasing ... reducing the likelihood that he will have the political capital to continue driving fiscal stimulus in the U.S. economy. This suggests to many market participants that the era of U.S. outperformance is likely to end," said Karl Schamotta, director of FX strategy and structured products at Cambridge Global Payments in Toronto. 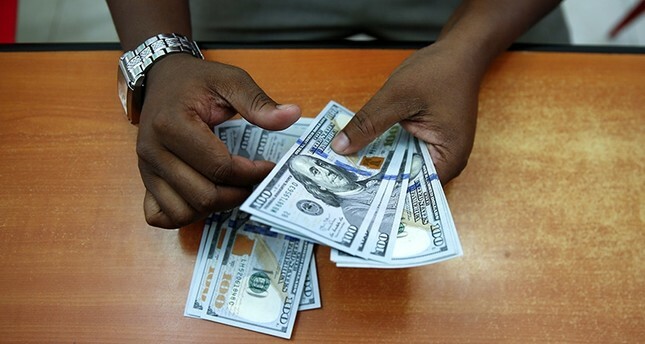 The lira stood at 6.0500 at 1111 GMT, compared with a close of 6.0600 on Tuesday. Trade was thinner than usual and probably mainly offshore after Turkish markets closed at midday on Monday for a week's holiday to mark the Muslim Qurban Bayram (Eid al-Adha) holiday. The Turkish currency has been targeted in a series of economic attacks since Washington ordered tariffs in retaliation for the arrest of pastor Andrew Brunson on charges of espionage and links to the PKK and the Gülenist Terror Group (FETÖ) in the aftermath of the July 15, 2016, failed coup. Easing concerns about the Turkish currency and the Italian budget, as well as short-covering, sent the euro up for the sixth consecutive day. The euro gained 0.16 percent to $1.159, close to the two-week high of $1.162 touched earlier in the session. That marked a nearly three-cent rebound for the single currency from 14-month lows hit last week. "The euro is helped by a narrowing BTP/Bund spread, slightly lower U.S. real yields and most of all, short-covering," said Kit Juckes, foreign exchange strategist at Societe Generale, referring to the gap between Italian and German government bonds. Minutes of the Fed's last meeting, due later on Wednesday, were expected to confirm it is on course to raise rates twice more this year. "Everybody would be surprised if there is anything to dig up in the minutes. It looks smooth for the Fed to hike in September and then in December. There has been no indication that the Fed is hesitating," said Niels Christensen, an analyst at Nordea. The dollar moved sideways against the Japanese yen at 110.44 yen. It had weakened to 109.76 overnight, its lowest since late June.